Chambers is delighted to welcome Arfan Khan to 42 Bedford Row today. We're teaming up with @itsalawyerslife and Hobbs London for an evening of Body Confidence, champagne, fashion and fun. Chambers are sad to announce the death of Patrick Hamlin, after a short illness. In this Bulletin, Michael Grant discusses a recent County Court judgment of His Honour Judge Luba, QC, concerning prohibitions in long residential leases and the well-known short-let website ‘AirBnB’. 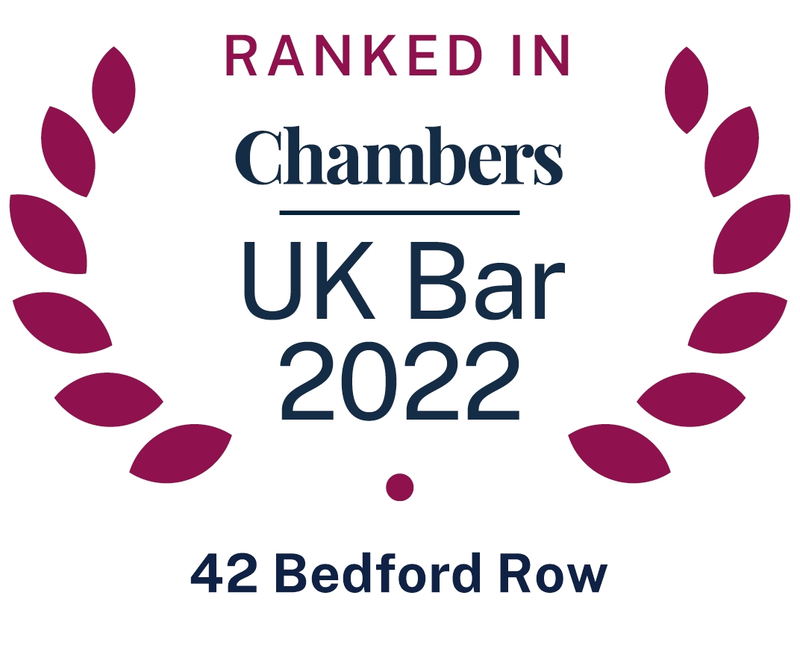 Over two days, 17th and 18th October the barristers and staff at 42 Bedford Row are cycling from London to Paris and back, without leaving Chambers! Panayiotou v Waltham Forest, Smith v LB Haringey  EWCA Civ 1624 The demise of significance The Court of Appeal have considered the conjoined appeals of two homeless applicants who claimed that the Respondent housing authorities had applied a wrong legal test when considering whether or not they were ‘vulnerable’ within the meaning of s.189(1)(c) of the Housing Act 1996. 42BR beat-off strong competition from financial institutions and lawyers to claim second prize in the latest charity quiz for our chosen charity, Chicks. Chicks provide free respites breaks for disadvantaged children at their centres in Cornwall, Devon and Derbyshire. The quiz was hosted by Incisive Media in Haymarket, London, and Lawrence Gosling, editor of Investment Week, acted as quiz master. We raised over £1,600 which will be used to help fund week long breaks for kids. Chambers has established the 42 Bedford Row Disability Law Essay Prize in partnership with the University of Oxford. It is the first ever academic writing award to be established at the Oxford Faculty of Law which focuses on legal issues affecting persons with a disability. Chambers hopes that this award will continue on an annual basis. When it comes to fashion, let’s face it, most lawyers are the human equivalent of a beige turtleneck. Not the ones Lawyers Life, hang out with though. Lawyers Life held its first live event and it was fantastic. Zimran will be assisting with Law and Anthropology programme until 2018 while continuing to practice at 42 Bedford Row. Keri has joined Chambers from Hampshire County Council, where she spent 13 years advising on all aspects of Local Government law, specialising in the fields of education, child and adult social care. Zimran Samuel (42 Bedford Row) spoke at the Bar Human Rights Committee (BHRC) last week on Thursday 16th July 2015. The High Court (Chancery Division) has given judgment in Edray Ltd v Anthony Canning (Lawtel LTL 4/6/2015; Westlaw 4/6/2015). Chambers is delighted to announce that Mary Lazarus is to be appointed one of Her Majesty’s Circuit Judges on 15th April 2015. Neil May has been appointed as Chief Executive of 42 Bedford Row. 42 Bedford Row Annual Lecture: What Price Justice? Chambers sponsors event for former United Nations Special Rapporteur Asma Jahangir. The lecture entitled ‘Law, gender and religion’ was chaired by Lord Justice McCombe (July 2014). Where a defendant had filed an acknowledgement of service but had not disputed the court's jurisdiction within 14 days after filing it, as required by CPR r.11(4), he was not entitled to extra time to serve notice to dispute jurisdiction even though the claimant's claim form had been served on the defendant outside the jurisdiction after the six-month period required for service. Philip Newman represented the applicant. Scott Matthewson successfully argued that article 8(1) was not engaged where a non-smoking prisoner was forced to share a prison cell with a smoker for a period of a week. In a series of five informative papers Jeremy Rosenblatt, barrister and international law and Child abduction specialist, sets out :- (i) An overview of International Child Abduction, (ii) Seeking Declarations in International Law, (iii) Dealing with children's objections to a return home, (iv) Private International Law; Problems in England and Wales, (v) Understanding Article 15 and Brussels II Revised. 42 Bedford Row and a substantial number of 13 King’s Bench Walk are delighted to announce that they will merge on 12th May 2014. The new set will be known as 42 Bedford Row and will operate from that address. Lord Justice Ryder, Denise Carter OBE and members of the government’s Forced Marriage Unit spoke at the inaugural event of the Human Rights Working Group. The event was hosted by chambers on 4th February 2014. EU Regulation on Mutual Recognition of Protection Measures in Civil Matters to come in force from 2014. The Regulation will give significant cross-EU powers and orders for the victims of domestic violence and others needing protective measures. COURT OF APPEAL: COMPLY OR BE STRUCK OUT! The Bar Human Rights Committee has been nominated for the Bar Pro Bono Unit award for writing the Child Rights Manual for Unicef Nigeria. Zimran Samuel of 42 Bedford Row formed part of the legal team who wrote and edited the forthcoming publication. The London Borough of Lambeth v Loveridge  EWCA Civ 494 (10 May 2013) This was a successful appeal by the local authority landlord against a county court award of statutory damages (under section 28 of the Housing Act 1988) in the sum of £90,500 to a secure tenant for unlawful eviction from his flat. A NHS TRUST v K (2012) EWHC 2922 (COP) This was an application by a NHS Trust for an order permitting doctors to perform major surgery, a hysterectomy, on a patient, Mrs K, who had refused to consent to the surgery but who lacked legal capacity to decide whether or not to consent to it. An end to “Squatters’ rights”? £350m cut to legal aid judged a 'false economy' and block to swift justice for most vulnerable "But it would actually be a false economy. Without legal advice more private family disputes would end up in court; without legal representation the hearings of them would take longer; and without assistant legal navigators the trial judges would more often be blown off course so there would be more appeals.